Mario & Luigi: Dream Team (known as Mario & Luigi RPG 4: Dream Adventure in Japan and South Korea, and Mario & Luigi: Dream Team Bros. in Europe and Oceania) is a title for the Nintendo 3DS. It is the fourth installment in the Mario & Luigi series. This game is part of the "Year of Luigi," celebrating the 30th anniversary of Luigi's debut. As such, Luigi has a much bigger role in the game than in the previous Mario & Luigi games. A special edition Nintendo 3DS XL with a Luigi themed print was released in Japan as part of the event and includes a digital copy of Mario & Luigi: Dream Team pre-installed on the SD card. The name comes from the term "dream team", a team composed of the greatest performers of a certain talent. One day in the Mushroom Kingdom, Princess Peach, Mario, Luigi, Toadsworth, and some Toads are invited to Pi'illo Island, which is said to contain a special power that makes people fall asleep. During the flight, a dark pillow falls onto a blimp and transforms into a dark figure who Mario defeats. After defeating him, the blimp malfunctions and crashes into the Pi'illo Blimport. However, it is revealed that it was all Luigi's dream. The group proceeds to Pi'illo Castle, where they meet Starlow. Mario and Luigi go to a room where Peach and Toadsworth accidentally set off a test platform sending them to ancient Pi'illo ruins. Mario & Luigi follow and eventually find Peach and Toadsworth, as well as a Pi'illo, which later turns out to be Prince Dreambert. They find a collection room where Luigi takes a nap on the pillow. After everyone gathers in the collection room, a Dream Portal opens a portal to the Dream World. The dark figure from Luigi's dream pulls Princess Peach into the Dream World. After Mario chases after Peach into Dreamy Pi'illo Castle, with the help of a dreamy version of Broque Monsieur, he comes across Dreamy Luigi, Luigi's dream representation, who assists Mario through his treks in the Dream World. The Bros. catch up to the dark figure, who creates a portal to Dream's Deep and flees there, sealing it up afterwards. Mario and Luigi then find a Nightmare Chunk and break it, freeing Prince Dreambert. He explains that there were two powers in Pi'illo island, the Dream Stone and the Dark Stone. Both stones have the power to grant wishes. The Pi'illo folk were protecting the stones from misuse. Then the Bat King Antasma came to steal the Dark Stone to fulfill his desires. The Pi'illo could not defeat him, though they managed to trap him in the Dream World, however Antasma destroyed the Dark Stone at the last second, thus causing the Pi'illo's souls to be trapped in Nightmare chunks upon being hit by one. Prince Dreambert then runs out of the room, the Bros. following him. After catching up to Prince Dreambert and saving some Pi'illos they learn from one that Eldream, a Pi'illo elder, knows how to reach Dream's Deep. The Bros. then set off to find him in Mushrise Park. Upon arriving at Mushrise Park the Bros. learn that Brickle, the Manager of the park, has Eldream but will not give him up unless they catch him. After the Bros. free him from being stuck in the fountain top, Brickle allows them to use his bed in his hut. After freeing Eldream, he opens the portal to Dream's Deep where the Bros. enter. Meanwhile in the real world, Bowser appears along with Kamek and the newly-formed Elite Trio, Private Goomp, Corporal Paraplonk and Sergeant Guy. 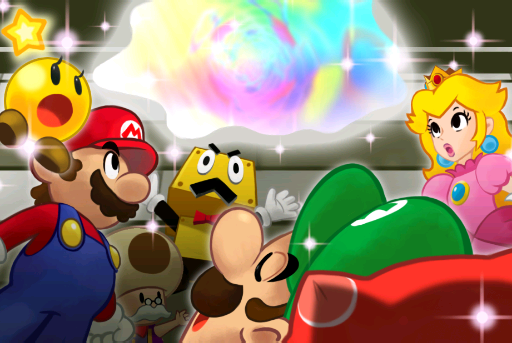 Bowser follows the princess's scent to Dream's Deep right where the Bros. are confronting Antasma. Upon being convinced by Antasma and his claims, Bowser teams with him and decides kidnap Peach later. Back in the Real World, the Bros. learn that Antasma is going after the Dream Stone, which resides in Dozing Sands. As the Bros. approach the ruins that hold the Dream Stone, they discover Antasma and Bowser had already stolen it. Prince Dreambert realizes that the Dream Stone's altar is a Dreampoint, a point where one can enter the Dream World easily. Mario enters the Dream World as Luigi sleeps on Prince Dreambert on the Dreampoint, into Dreamy Dozing Sands. 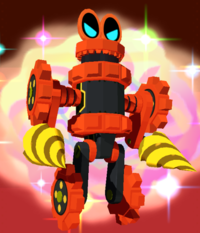 After finding the Dream Stone's Soul, it tries to hide as it doesn't want to get involved but is pestered to the point it is consumed by fury, turning into the massive Robo-Drilldigger to get rid of the Bros.. Dreamy Luigi, fusing with many Luiginoids, then becomes Giant Luigi to defeat Robo-Drilldigger. After doing so, the Dream Stone's Soul tells Luigi where the Dream Stone was taking, Mount Pajamaja. To reach Mount Pajamaja, the Bros. need to take a tour there, signing up requiring them to go to Wakeport. However, the tour can't begin until Big Massif, the big brother of Lil' Massif and one of the tour guides, shows up. The Bros. later find Big Massif voluntarily asleep on a Dreampoint. 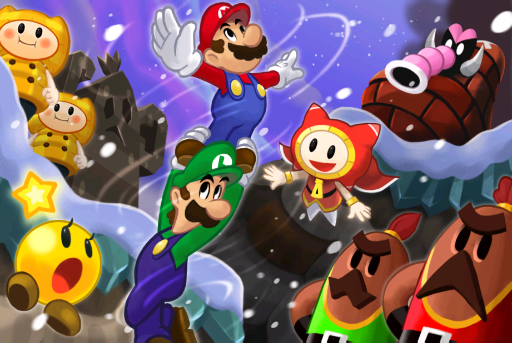 Mario enters Dreamy Wakeport, but discovers that to meet Dreamy Big Massif, they have to beat his four apprentices with special conditions involved. After beating all four, it is revealed that Dreamy Big Massif was disguised as the Referee. Upon beating Dreamy Big Massif, Big Massif wakes up, notices he slept in and starts the tour to and up Mount Pajamaja. After climbing up to the summit, the Bros. find Antasma, Bowser, Kamek and the Elite Trio starting to play music known as the Dreambeats, making all who hear it fall asleep, except for Pi'illos, Starlow, Antasma and Bowser (who is covering his ears). The Bros. try to escape but Luigi falls asleep. Mario manages to escape the Dreambeats by diving through the Dream Portal of a nearby Dreampoint into Dreamy Mount Pajamaja, but the Dream Portal soon closes as the music has made Luigi so deep in his sleep that it can't remain stable. Meanwhile, the entire island falls asleep and Dream Orbs, orbs created by those who sleep, are absorbed into the Dream Stone to power it. As the Dream Stone finishes charging, Antasma wishes for a Castle for him and Bowser, and surrounds the castle with an impenetrable shield. As Mario gets out of the Dream World, the Bros. head to Pi'illo Castle, and find out that Princess Peach is at Driftwood Shore. When they arrive, they are told to go see Broque Madame who has disguised Peach and Toadsworth as Block folk. It is suggested that Peach should be hidden in the Dream World from Bowser. However, it is revealed that Peach was actually Kamek in disguise, who summons the Elite Trio to fight the Bros.. After being defeated, they are teleported out by Kamek who then leaves. The Bros. start looking for a way to get to Neo Bowser Castle when they discover Dr. Snoozemore has returned and go to see him. Upon finding him, he suggests trying to find the Zeekeeper to break the shield around the Castle. To summon the Zeekeeper, they must use the Ultibed, which in order to access, must first be built by a Bedsmith once they collect the five Zee Parts scattered across the island. The Bros. then find Pi'illoper who takes them to his prize possession, Bedsmith, who is trapped in a Nightmare Chunk. 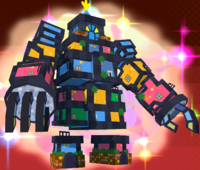 When the Bros. finally reach the Nightmare Chunk, Earthwake, the guardian holding the nightmare chunk in its head, activates and forms a robot made of buildings resulting in another Giant Luigi battle. After beating Earthwake and breaking the nightmare chunk, Bedsmith is more than happy to help, but needs to meet the Bros. at his workshop in Somnom Woods to build the Ultibed. After arriving in Somnom Woods, Bedsmith makes the Ultibed, and then tells the Bros. to find the Zeekeeper they would have to sleep in the temple in Somnom Woods. To reach the temple, the Bros. have to free the Pi'illo Masters which hold the keys to reaching the temple. In Dreamy Somnom Woods, Mario and Dreamy Luigi find the Zee Egg. Mario tries breaking the egg, releasing the Zeekeeper who fights Giant Luigi. After the Zeekeeper is defeated, he notices Prince Dreambert with the Bros. and upon hearing the dire situation reluctantly agrees to help. The Zeekeeper unleashes the Wakebeam upon the castle, shattering the barrier and causing the castle to plummet to the ground, allowing the Bros. to then storm the castle. Upon infiltrating Neo Bowser Castle, Kamek tries to hinder Mario and Luigi's progress, but fails. The Bros. then find Bowser sleeping on Antasma as a pillow with a barrier protecting him. Luigi suggests they enter Bowser's Dream World, where they fight Bowser in his giant form. After losing, Bowser flees with Antasma, and Mario and Luigi pursue the duo. Antasma attempts to challenge the Mario Bros to a fight with the help of Bowser, but to the surprise of everyone, Bowser turns on Antasma, and he then reveals that was planning to double-cross Antasma all along, and flees to the top of the castle. Antasma reveals he had made a wish on the Dream Stone for the ability to create Dream Portals at some point, and flies through one just before besting Dreambert in a duel. Mario decides to avenge him and jumps into the Dream Portal himself, with Dreamy Luigi and a barely conscious Prince Dreambert joining the fight to assist him. After Mario defeats Antasma for good, they leave the Dream World, knowing they still have Bowser to take care of. After avoiding Elite Trio's attacks, Mario, Luigi, Starlow, and Prince Dreambert make it to the castle balcony, where Bowser and Peach await. As Bowser boasts about the power he now has Peach and Starlow activate their wish power and, at the request of Prince Dreambert, destroy the Dream Stone. 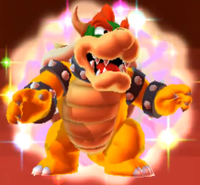 Bowser in turn inhales the Dream Stone's pieces and becomes Dreamy Bowser. Mario and Luigi engage battle with him, and upon winning, knock him flying into the sky. The castle begins to crumble without the Dream Stone sustaining it, but the Zeekeeper gives Mario and friends a lift back to Pi'illo Castle just in time. Back at the castle Prince Dreambert presents the Zeekeeper with the Dream Stone's essence extracted from Bowser's body, hoping to get it repaired. He does so, but it becomes the Dream Coin, which spouts infinite coins, instead. The Zeekeeper explains that he made it this way because simply having the power to grant all wishes is too risky, and it's more intuitive to "buy" one's wishes. Meanwhile, Bowser and his minions are desperately trying to escape the island, and Bowser announces he will come back for revenge. They are then showered in coins from the Dream Coin, causing the Koopa Clown Car to fall into the ocean. The gameplay shifts between Luigi's dream world, where Mario and Luigi move in a 2-D fashion, and the regular world, where they freely roam the overworld. While Mario is playing inside Luigi's dreams, Starlow can move Luigi's face to affect the area, such as making him sneeze to spin platforms. The battles give the player coins directly from enemies in battle, like Paper Mario: Sticker Star. Badges similar to those in Mario & Luigi: Bowser's Inside Story make a return in this game. Sometimes Gifts also appear in between or after battles. Giant battles from Mario & Luigi's Bowser Inside Story return, this time with Luigi instead of Bowser. The games art style also changes in this installment due to the shift to 3D. Unlike the previous games' basic sprite style, this installment uses a pre-rendered visual that makes the sprites smoother with the backgrounds. The environment uses 3D models while in giant battles, characters use 3D models for the first time in the series. The bottom screen of the 3DS displays the area map. Unlike previous installments, the map shows and follows the actual location of the Bros. The battle system in the overworld is similar to those in previous titles, but the system in Dream World is different, as Mario will fight, merged with Luigi's dream form. As a result, he has higher stats, with his HP and BP increased by 1.5x. There are now five categories of attack, as in Mario & Luigi: Partners in Time. They are Jump, Hammer, Item, Luiginary Attacks (in the Dream World) or Bros. Attacks (in the Real World), and Flee. If a player loses a battle and tries again, a sixth option appears, which is the Hint option. Also during battles if the player fails at Bro moves a numerous amount of times in battle a slo-mo feature will activate allowing for easier hits. 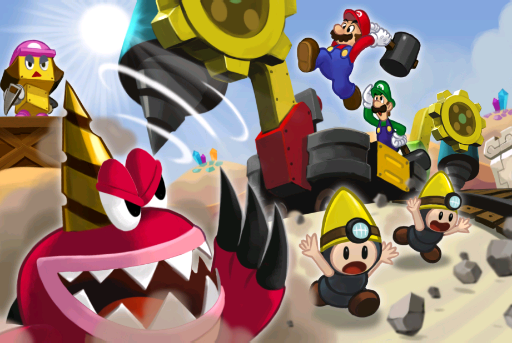 There can be more than five enemies in battle, as in Mario & Luigi: Bowser's Inside Story. The Rank feature returns again. One change is the lack of Lakitus from the level up system. Status effects can be caused by enemy attacks, items, Bros. Attacks, or the attributes of equipped gear. Some increase/decrease Mario and Luigi's stats and some them from attacking. In this game, there is no Poison effect like the previous Mario & Luigi games. Those which raise and lower stats will stack with all other status effects with the exception of raising a currently lowered stat (or vice versa). All of these effects can be cured with a Refreshing Herb. Trip This effect leaves Mario or Luigi unable to avoid enemy attacks. It will end when their turn comes or possibly after getting hit. Entering battle when the enemy touches the rear of Mario or Luigi will automatically inflict that brother with the status. Dizzy This effect prevents Mario or Luigi from dodging attacks until their turn comes, but can be lost after getting hit. For enemies, it prevents them from attacking for several turns. Burn/Char This effect is similar to the Dizzy effect, but hurts the character inflicted with it after each turn. For Mario and Luigi, the effect ends when it becomes their turn or possibly after getting hit. For an enemy, it lasts several turns. Mini This effect makes either Mario and Luigi very small, in addition to reducing the damage they can inflict. In the dream world, using the jump or hammer attack when mini still causes the Luiginoids to be normal size. If a brother faints in the real world whilst the other is suffering the effect, they will automatically lose the Mini status so they can carry the brother during enemy attacks. Pow Up This effect increases the Power of Mario or Luigi, allowing them to deal more damage. Def Up This effect increases the Defense of Mario or Luigi, reducing the damage they sustain. Speed Up This effect increases the Speed of Mario or Luigi, allowing them to act sooner than normal. Pow Down This effect decreases the Power of Mario or Luigi, reducing the damage they inflict. It can combined with the other decreasing effects. Def Down This effect decreases the Defense of Mario or Luigi, increasing the damage they sustain. Speed Down This effect decreases the Speed of Mario or Luigi, making them to act later than normal. There are out-of battle techniques that Mario and Luigi learn throughout their adventure. The first techniques are jumping. The player uses (or ) for Mario and (or ) for Luigi. Upon pressing , it will cycle the bros' current techniques, which are paired in sets, going to to different ones gained later on. There are four sets of different techniques. When in the dream world, the only ability that both of the Bros. can use is the jump ability, while the hammer is exclusive to Mario, and only Luigi can use Luiginary Works. Same as Mario's jump but for Luigi. Luiginary Works are special abilities found in the Dream World. When Dreamy Luigi is near a Luiginary Work, both react to each other, causing them to be surrounded by a green light. Dreamy Luigi, then, can "possess" the object, creating a special object that can be controlled by the sleepy Luigi, with Starlow's help. As said by Prince Dreambert, the Luiginary Works are the objects of connection between the real world and the Dream World. A screenshot of right-handed play. Giant battles play similarly to the ones in the previous installment, with the boss on one screen and Dreamy Luigi on the other. The battles now offer a choice of left-handed or right-handed play; in left-handed play, the boss will be on the right screen and Luigi will be on the left screen, and in right-handed play, the boss will be on the left screen and Luigi will be on the right screen. 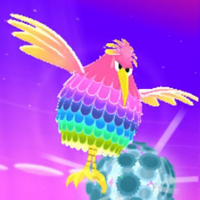 Attacks and counter-attacks, like in the previous game, are used by tapping repeatedly, sliding in correct shapes and sliding repeatedly. As the playable character being different in this game, Luigi is instead able to perform a variety of the moves he uses in normal battle, such as his jump and hammer attacks, the latter having two variations. He is also given the option to work together with Mario to perform both a useful healing technique and a spinning stomp attack, as well as a finishing attack involving Mario piercing through the boss in question's weak point while riding a Star thrown by Dreamy Luigi. Upon completing the game, two new features will be available, Jukebox and Hard Mode. Jukebox allows the player to listen to the game's soundtrack. In Hard Mode, enemies are stronger, and the maximum amount of each item the bros can carry is 10. Like the previous games, should the player lose in a battle in Hard Mode, rather than having the option to restart it, they will automatically be taken back to the title screen. Upon beating the final boss in Hard Mode, the player gets to view a two-screened image featuring all the main characters and main bosses in the game. Bros. Attacks are powerful and complex team techniques that Mario and Luigi perform in unison in the Real World. These moves are unlocked by gathering the ten Attack Pieces in a particular area. Like in the previous game, the player is given the option to practice their unlocked Bros. Attacks in the menu. In this game however, certain Bros. Attacks are influenced damage-wise by either Mario's or Luigi's Boots POW stat, Mario's or Luigi's Hammer POW stat, or just Mario's or Luigi's normal POW stat, whose variable POW stat depends on who's performing the attack and how it involves them. Once again exclusive to this game, Mario and Luigi each have Bros. Attacks unique to themselves that only they can activate. Some of Mario's Bro Attacks mainly focus on single targets, while most of Luigi's attack multiple foes. Zee Egg Slide the Circle Pad left/right to align the Zeekeeper and the Wakeorb. Once the Wakeorb and the Zeekeeper are aligned, Mario or Luigi will jump out! Use the A Button for Mario and the B Button for Luigi to hit the Wakeorb! Mario throws the Zee Egg, unleashing the Zeekeeper for him to take Mario and Luigi into the skies and prepare a Wakeorb for Mario and Luigi to hammer upon lining up with it for it to crash down on a single target mainly with maximum damage. 15 Hammer Mushrise Park - When the player rescues all Pi'illos, Eldream will reward them with the ten pieces. 3D Green Shell* Use the A Button for Mario, and the B Button for Luigi, and kick that shell! The 3D Green Shell has the brothers kick a green shell. It targets all ground enemies; the shell is kicked at enemies randomly. It ends with Luigi using a charged kick upon Mario kicking it to him. 4 Boots Mushrise Park - All ten pieces are given upon Brickle being freed from the main fountain. Slingsniper* Slide and hold the Circle Pad down to draw back, hold the B Button, and aim. Tilt the 3DS to line up your target, then release the B Button to launch Luigi! Mario pulls Luigi back in the string of a Slingsniper. The player must use the 3DS to aim to successfully sling Luigi into the target enemy. 9 - Mount Pajamaja - All ten pieces are given to Mario and Luigi upon solving a Ball Hop puzzle for the Massif Bros..
Luiginary Attacks, like Bros. Attacks, are powerful and complex team techniques that Mario and a group Luiginoids perform in unison in the Dream World. These moves are unlocked by gathering the ten Attack Pieces in a particular area. Like with Bros. Attacks, the player is given the option to practice their unlocked Luiginary Attacks in the menu. Much like Bros. Attacks, certain Luiginary Attacks are influenced damage-wise by either Mario and Luigi's Boots POW stat, Mario and Luigi's Hammer POW stat, or just Mario and Luigi's normal POW stat. As Mario battles solo (in a sense) in the Dream World, only he can activate these moves. * - Mandatory Bros./Luiginary Attacks. Kamek Block with Kamek's hat and glasses used to reveal warp points from Kamek's spell in Neo Bowser Castle. Mushroom Restores 30 HP (to a single bro). Super Mushroom Restores 60 HP (to a single bro). Ultra Mushroom Restores 100 HP (to a single bro). Max Mushroom Restores 160 HP (to a single bro). Nut Restores 15 HP to both Mario and Luigi. Super Nut Restores 30 HP to both Mario and Luigi. Ultra Nut Restores 50 HP to both Mario and Luigi. Max Nut Restores 80 HP to both Mario and Luigi. Syrup Jar Restores 20 BP. Supersyrup Jar Restores 40 BP (to a single bro). Ultrasyrup Jar Restores 60 BP (to a single bro). Max Syrup Jar Restores 80 BP (to a single bro). Candy Restores a little bit of HP and BP (to a single bro). Restores 40% of a single bro's HP and BP. Super Candy Restores a decent amount of HP and BP (to a single bro). Restores 60% of a single bro's HP and BP. 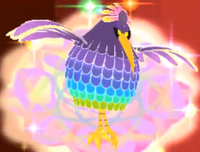 Ultra Candy Restores a solid chunk of HP and BP (to a single bro). Restores 80% of a single bro's HP and BP. Max Candy Completely restores both HP and BP (of a single bro). 1-Up Mushroom Revives a fallen bro with half of his HP. 1-Up Deluxe Revives a fallen bro with full HP. Refreshing Herb Cures statuses like BURN, DIZZY, TRIP, and MINI. Taunt Ball Enrages an enemy in the background. Whooooosh! Brings a background enemy to the battlefield to be fought. Shock Bomb Makes enemies dizzy... maybe? Makes all enemies dizzy, but has no effect on bosses. Boo Biscuit Grants damage immunity. Helps with dodge training! Secret Boxes Does...who knows what? Use one to find out. Performs a random badge effect. 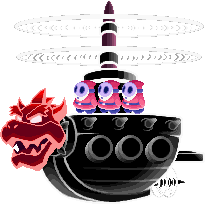 *Neo Bowser Castle was originally not on Pi'illo Island, but floating in the air near the island. However, it crashes onto Pi'illo Island when the Zeekeeper breaks the barrier. In Wakeport during Mario and Luigi's travels, the player may encounter a male Hooski wanting to propose to nearby female, but is lacking the proper proposal gift. Upon Mario and Luigi agreeing to help, they are given a plush Zeekeeper to use in order to get something better to propose with, initiating a brief trading sidequest. Mario and Luigi first trade the plush Zeekeeper for a rare fruit with a Shelltop in the nearby item shop, afterwards swapping it for a Yoshi Egg with a Red Yoshi in the hotel district, which they then swap for a photo of Peach with a Toad by the tour center, which they then swap for the Book of Ruins with a Brock researcher to the north of the Toad, which they then swap for a photo of Queen Bean with a Beanish in the gear shop, which they then swap for a lost camera with a Bean in one of the buildings in the hotel district, which they then give to a Toad near the rooftops of the hotel district in exchange for info about a bird burying something between the nearby umbrella and fountain, which then turns out to be upon the Bros. digging it out, a Pi'illo ring which Mario and Luigi hand to the Hooski for him to then propose with, the female accepting after a short cutscene which ends with the Bros. being rewarded greatly with a Sap Hammer, Heart Bean DX, some Rally Wear, and a 1-Up Mushroom, and if the player talks to him afterwards, he'll give the Bros. an idea of where to go next in Wakeport. During Mario and Luigi's travels in Wakeport, they come across Kylie Koopa upon entering a house, and discover she's the guidebook writer for the island. She offers some work for them, involving them finding camera blocks around the island, bringing them back here and deciphering them. Each shot can be taken back and played as three of the same photo puzzles of differing levels; with each higher level, the photo covers more of the scene, and the games give the player more time to do the puzzle. The Level 1 reward is 100 coins with a time limit of 3 minutes, the Level 2 reward is 300 coins with a time limit of 4 minutes, and the level 3 reward is a DX Bean of varying stat with a time limit of 6 minutes. Upon Mario and Luigi's first visit to Wakeport, they may come across a Shelltop on a stand, apparently hosting an event known as the Mad Skillathon, a contest for those with skills, with rewards included. Mario and Luigi, after a short conversation, decide to take part using their Bros. Attacks, as the Shelltop counted those as skills. 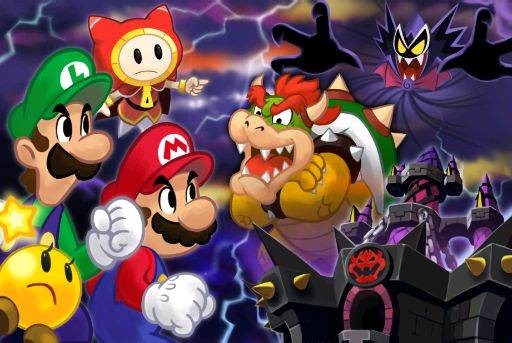 The Mad Skillathon is much like in Mario and Luigi: Bowser's Inside Story in the sense that it's a Bros. Attack endurance game. After getting S rank in all seven challenges, the player is awarded with the Pro Wear. These are the list of rewards gained from hitting the B, A or S rank scores, them respectively being 200 for B, 500 for A and 800 for S.
Upon Mario and Luigi's first visit to Driftwood Shore, they meet Broque Madame on a stand, who suggests the idea of the Bros. entering her dreams due to her boredom at her shop and her crave for excitement. This is much like the Mad Skillathon, however is the Luiginary Attack version for it. These are the list of rewards gained from hitting the B, A or S rank scores, them respectively being 200 for B, 500 for A and 800 for S. After getting S rank in all four challenges, the player is awarded with the Supreme Boots. In Driftwood Shore, Mario and Luigi come across a Shelltop during their treks in the area. Upon beating his game the second and final mandatory time, the Shelltop allows Mario and Luigi to play upon returning to him at will for the usual price of 10 coins, with the inclusion of prizes if Mario and Luigi are good enough. For listings of clothing, badges, level ranks, enemy statistics, level-up progressions and shops in the game, see the respective pages. For listings of all the Expert Challenges and rewards gained from them, see the respective page. For listings of all the Pi'illo locations and Bean locations in the game, see the respective pages. Mario and Luigi do not let out their battle cries of "Let's-a-go!" and "Okey-dokey!" respectively when starting a battle. In place of the brothers' cries, the battle transition shows off how the battle was entered (i.e. a color-coded boot or hammer depending on which brother attacked attacked and how they attacked, or a "!" for bumping into an enemy). However both of these features were added in later entries. This is the first game in the series where Bowser is consciously the final boss. This is also the first game where Bowser isn't the tutorial boss, as Antasma occupies that role instead. To accommodate the 3D feature of the Nintendo 3DS, the game's art style is radically altered to appear 3D while still using sprites. The letters on Mario and Luigi's caps are red and green, respectively, instead of black, and Luigi's pants reach his shoes, hiding his socks. The brothers' mouths are also visible, and none of the enemies have black outlines. However, Dreamy Bowser has a white outline. In addition, at certain points the game uses 3D models where sprites would not work with the stereoscopic 3D (such as during giant battles), making this the first Mario & Luigi game to use full 3D graphics. Fawful, a recurring character throughout the series, does not make an appearance in this game although there is an unknown NPC that says one of his main quotes when talked to. The Stache point system has been dropped; the stat is now used only for Lucky hits. Bosses always drop exclusive items/gear upon defeat (with the exception of Mammoshka, whose probability of dropping exclusive goods is still under 100%). The player does not lose coins when running away from battles. This is the second game in the series in which Mario and Luigi are the only playable characters in the game (though there is Dreamy Luigi in Dream World). This is the first game in the series where Battles do not take place on the touch screen (except for Superstar Saga, due to the GBA only having one screen). Instead, the Badges take up the Bottom screen and Mario and Luigi fight on the top screen. 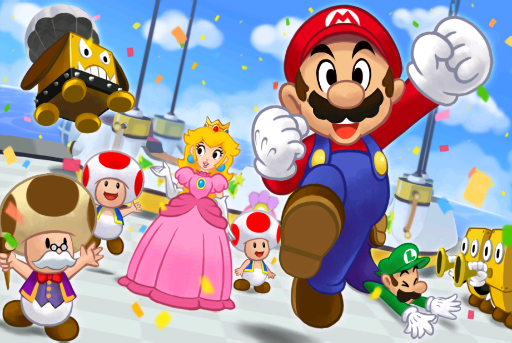 This is the first game in the series where the player cannot go into Peach's Castle, as the player gains control of Mario after he leaves the Mushroom Kingdom. This is the first game in the series which doesn't feature the Poison status effect. Instead the Mini status effect occurs. The Real World - the player can explore a segment of Mushrise Park. 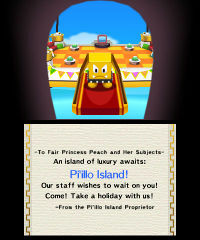 The Dream World - the player can explore a combination of Dreamy Pi'illo Castle and Dreamy Dozing Sands. 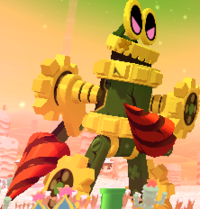 Boss Battle - the player is given the option of either facing Grobot in the real world or Bowser and Antasma in the Dream World. In Mushrise Park, the objective is to destroy all the rocks, much like how Mario and Luigi must break all the rocks in certain areas upon their return to Mushrise Park. The area has also been changed to prevent the player from exploring other areas. 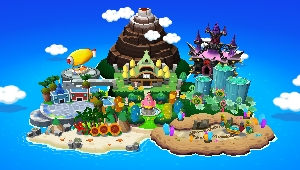 In the Dream World, some areas have been combined to showcase the Luiginary Works. Additionally, in the battles, the available Bros. and Luiginary Attacks use half as many BP as they do in the actual game. Donkey Kong: One of the Rank-Up bonuses in this game is called Jump Man, a reference to Mario's alternate name, Jumpman, for the arcade release. Super Mario Bros.: A cover of this game's main theme is heard while a tutorial is being displayed. Super Mario World 2: Yoshi's Island: Bandits originated from this game. Additionally, in some versions of the game, Bowser before his Giant Battle states he invented transforming into a giant while Luigi was in the cradle. Super Mario 64: One counter-attack Giant Luigi uses against Giant Bowser involves Luigi grabbing him by the tail and spinning him around before launching him off the platform, much like in the Bowser battles of Super Mario 64. Also, a Shelltop in Dozing Sands sings a song and mentions Jolly Roger Bay. Paper Mario: In the third and final battle against Kamek in Dreamy Neo Bowser Castle, he will create three different colored clones of himself: red, green and white. The green clone can raise defense like Green Magikoopas and the white clone can heal its allies like White Magikoopas. Luigi's Mansion / Luigi's Mansion: Dark Moon: One of the messages from Luigi displayed in Dream's Deep is "I fight ghosts!" Super Mario Sunshine: Bowser Jr. uses his paintbrush as an attack. 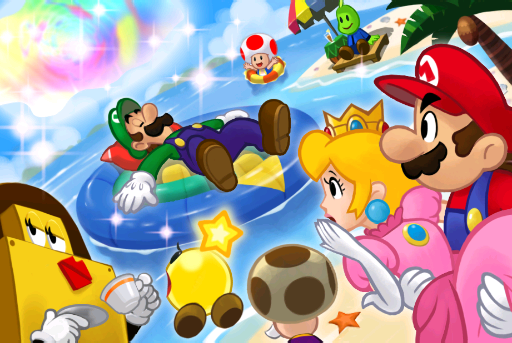 Also, the credits pictures are similar to this game's; showing Mario and Co. enjoying a vacation. Mario & Luigi: Superstar Saga: Popple and other Beanish characters appear in this game. Part of Driftwood Shore's theme is a cover of Oho Oasis's music. The way the Mario Bros. get to Big Massif's Hooraws by having to go through their own puzzle-filled sections in Dreamy Wakeport is similar to how the the Koopalings in Bowser's Castle were reached in the first game. When fighting Bowser Jr., he may summon two Shy Guys to carry a fiery rope that the brothers have to jump over to dodge in the same manner as the Border Bros in Superstar Saga. In this game, Somnom Woods serves as the penultimate area after collecting all the vital pieces of the Ultibed, just like how Joke's End was the second-to-last area to visit after collecting all the pieces of the Beanstar. 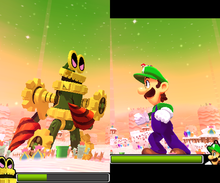 Also, when perched on the Luiginary Stack, Mario's standing pose was his battle pose in Superstar Saga. When Mario and Luigi are taught the Mini Mario and Mole Mario moves, the character who teaches them says they learned it from a movie. 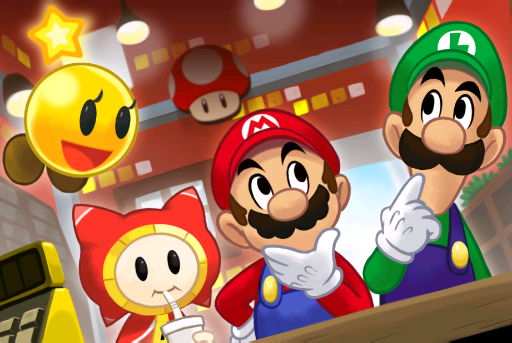 In Mario & Luigi: Superstar Saga, it's revealed that a movie of their adventure was made after the credits finish. Mario & Luigi: Partners in Time: The Bros. Ball attack from this game returns as a Bros. Move in the overworld, under the name Ball Hop. Also, Bowser resembles Shrowser when possessed by Antasma. Kylie Koopa also reappears along with a picture of a Shroob. Mario & Luigi: Bowser's Inside Story: The badges are similar to the ones from this game. Starlow, Broque Monsieur, Broque Madame, Broggy, Private Goomp, Corporal Paraplonk, and Sergeant Guy return as well. Bowser's theme is reused. The Banzai Bill Cannon re-appears as well as a prop during the battle with Private Goomp, Corporal Paraplonk and Sergeant Guy. When Giant Luigi fights Giant Bowser in Dreamy Neo Bowser Castle, he referenced his giant battles from this game, and also said "SHOWTIME!" before the fight begins. 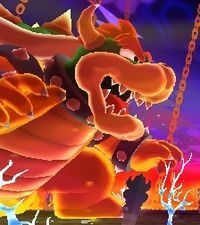 In the final battle, before Bowser becomes Dreamy Bowser, he inhales the fragments of the shattered Dream Stone using the inhaling power he received in this game. The Earthwake battle plays out the same as the Tower of Yikk battle. His cry of "Showtime!" before the battle itself calls back to his battle-opening cry of the previous game. New Super Mario Bros. Wii: Kamek is disguised as Princess Peach again. Super Mario 3D Land: Big Tail Goombas and Inky Piranha Plants appear in Dreamy Neo Bowser Castle. Paper Mario: Sticker Star: The √ and X panels from the Check-X Quiz are similar to the √ and X blocks from Snifit or Whiffit. New Super Mario Bros. U: Bombs very similar to the ones used by Lemmy Koopa in this game appear in the Bomb Derby attack. Super Smash Bros. for Nintendo 3DS / Wii U: An arrangement of the theme "Try, Try Again" arranged by the original composer Yoko Shimomura is used as the alternate track for the Paper Mario stage in Super Smash Bros. for Nintendo 3DS and a selectable track for the Woolly World stage in Super Smash Bros. for Wii U.
Mario & Luigi: Paper Jam: Many of the game's graphics are reused, although some characters have received new animations. All of Mario's and Luigi's battle animations are reused with the exception of new jumping in battle animations. One of the new Bros. 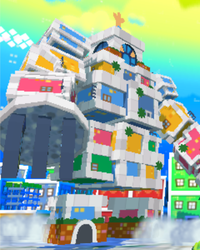 Attacks, known as Mega Thwonk, features Luigi as a giant, using the same model from the Giant Battles in Mario & Luigi: Dream Team. There are also two returning Bros. 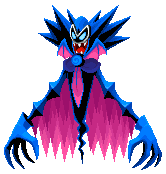 Attacks originally from Mario & Luigi: Dream Team. Similar to giant battles, Papercraft battles allow players to win four items. The name Neo Bowser Castle is re-used. Bowser's theme in Paper Jam is a cover of his theme from this game. Antasma makes a cameo in one of Bowser's Character Cards, which is actually their duel artwork from this game. Mario & Luigi: Superstar Saga + Bowser's Minions: A cover of this game's minigame music is used for the Barrel and Chuckola Bounce minigames, as well as the tutorial for Splart. A poster of Prince Dreambert in front of a Zeekeeper statue can be seen in the lobby of Yoshi Theater. Private Goomp, Corporal Paraplonk, and Sergeant Guy all wear their Elite Trio garb from this game, although this is probably a developer oversight. Super Smash Bros. 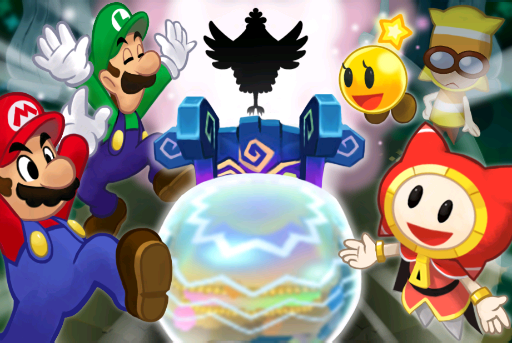 Ultimate: Prince Dreambert and Antasma appear as spirits. The game received aggregately positive reviews. Both Gamespot and IGN gave the game an 8/10, although it is the lowest review in the series up to that point by both of them. The reasons for this were that IGN believed that the overworld was less appealing than the Dream World and that the game's intro was sluggish and saturated with tutorials. GameXplain on the other hand believes that the game is fun, despite its minor flaws, and that it lives up to the other installments in the series; the game was given 4 1/2 stars out of 5. Nintendo 3DS Daniel Krupa, IGN 8/10 "Mario and Luigi Dream Team has great moments, but they’re almost always confined to its psychedelic dream sections, which teem with imagination and invention. Consequently I always found myself enjoying these sections far more than its overworld exploration, turn-based combat, and more traditional RPG elements. It's an uneven experience, but occasionally it grasps greatness, making it a worthy addition to an already distinguished series." Nintendo 3DS Simon Parkin, Eurogamer 7/10 "While the usual Nintendo weight and sheen is present in the dialogue, the humour has an unexpected thinness, especially in the first half of the game before antagonist Antasma - a bat-king who shares Bowser's fondness for pointless and rather artless princess kidnapping - forms an alliance with the lizard. This is an enjoyable but rarely essential entry to the Mario & Luigi suite, then. AlphaDream is to be commended for its willingness to build each new game around a different kernel of an idea, but, perhaps inevitably, some of those ideas will be smaller than others." Nintendo 3DS Mark Walton, GameSpot 8/10 "The classy combat and quirky characters combined with a levelling system, ranking system, gear to upgrade, and collectible badges and puzzle pieces that offer up new powers make Dream Team a rich RPG. It's also laugh-out-loud funny, even more so if you're a fan of Mario games thanks to some wonderfully self-aware jokes. And while the core combat system and feel of the game remain largely unchanged from previous games in the series, the dream sections with their Luigi-based silliness add just enough to keep things feeling fresh. 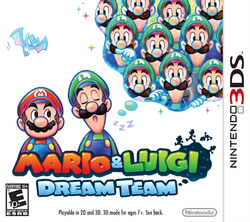 Mario & Luigi Dream Team is more refinement than reinvention, then, but boy is it a lot of fun." As of March 31, 2014, Mario & Luigi: Dream Team is the 13th best selling game for the Nintendo 3DS, having sold about 2.08 million copies worldwide. One of the most common glitches in the game is that, at some points, any actions that require the 3DS's gyroscope to perform may result in the game not registering any movement from the system. Two of the most likely points for this to occur are during the Zeekeeper battle and during the "Repel the Shell" portion of the Giant Bowser battle. It is unknown what causes this to happen. There are also some points in the game in which the game can freeze; this mostly occurs at Neo-Bowser Castle. However, the patch released on September 5, 2013, fixes instances in which this can occur. The game's executive producers were Tetsuo Mizuno and Satoru Iwata. The other producers were Akira Otani, Yoshihiko Maekawa and Toshiharu Izuno, with Shinya Takahashi serving as the general producer with Yoko Shimomura providing the game's music. "SCREEEK! I vanted to steal Peach's power...But I changed my mind! You are much stronger...and evil! SCREEEONK! Vork vith me! SCREEEP!" "I vish... TO CONQUER THE VORLD!" "SCREEK! I haff heard those vords before, a long time ago... But this time vill be different...I haff Bowser on my si-"
"SCREEYEE! I can open dream portals venever I vant now...For that is vut I vished the Dream Stone...In the dream vorld, I vill be at full strength...I haff changed, Dreambert. You haff been varned..."
"Give it to me straight. Princess Peach is gone? Hello? That is MY thing! Only I get to kidnap her! TREASON!" "But I don't have time to deal with you now. See, kidnapping Princess Peach is my calling in life! I don't care what you did; I'll find her and nab her!" "Blech! Say it, don't spray it, dingbat! I don't "vork" with anyone! Get real!" "Bad news, Super Loser Bros.! Big bad Bowser is about to be even big-badder!" "Transforming into a giant? I invented that, bud!" "Hear this! I will kidnap Peach OVER and OVER again until I pull it off! Failure isn't an option! And neither is giving up!" For this subject's image gallery, see Gallery:Mario & Luigi: Dream Team. For a complete list of media for this subject, see List of Mario & Luigi: Dream Team media. Description This patch fixes two bugs in the game that make it incompletable. The first one is on Mount Pajamaja, where the player would be unable to progress past the segment where Mario and Luigi must Spin Jump into the Massif Bros. to clear a field of icicles, should certain actions be taken, and another one that prevents Mario from completing the final Antasma battle in Dreamy Neo Bowser Castle (by causing the drop present containing the Dark Hammer to never open, causing the battle to never end, forcing the player to reset). The patch also fixes several bugs that cause the game to randomly freeze at inconvenient times. This patch also fixed a Miiverse exploit that could be performed by using pictures from the internet explorer, opening the game and then opening Miiverse. 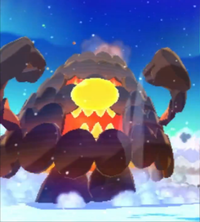 Fixes a bug that occurs on Mount Pajamaja where the Massifs use a spin jump to break icicles. This bug makes it impossible to proceed past this point if the player takes certain actions. Fixes a bug that prevents the player from finishing the final battle with Antasma. Fixes other issues so that the game plays as intended. This is also the final Mario game to use this type of ESRB rating system. 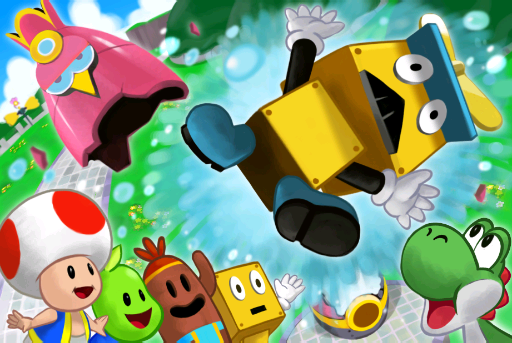 The reason for the change, starting from Mario Party: Island Tour onwards, is because they wanted to make it easier to see on mobile devices. This game was originally shown to be rated E by the ESRB like its predecessors, but was later changed to an E10 rating for unknown reasons. This is the second 3DS Mario game to receive a patch, the first being Mario Kart 7. The patch removes most freezing issues from the game and was released during September 2013. ↑ Knight, David. Mario & Luigi: Dream Team Prima Official Game Guide, page 20. ↑ 3.0 3.1 3.2 Knight, David. Mario & Luigi: Dream TeamPrima Official Game Guide, page 21. ↑ Knight, David. Mario & Luigi: Dream Team Prima Official Game Guide, page 19. ↑ 5.0 5.1 5.2 Knight, David. Mario & Luigi: Dream Team Prima Official Game Guide, page 22. ↑ Knight, David. Mario & Luigi: Dream Team Prima Official Game Guide, page 303. This page was last edited on April 13, 2019, at 19:22.